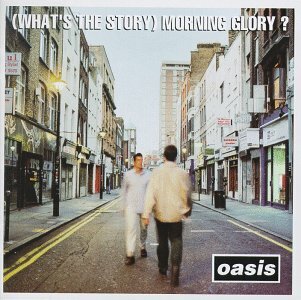 This week I’m reviewing one of the most important 90’s BritPop albums: (What’s The Story) Morning Glory? by Oasis. Yet another album with lukewarm reviews initially but is now considered a classic. Worth Your Time? Listen to it only while your driving. Twitter Review: Mediocrity thy name is Morning Glory. It has some qualities of a good album but those get overwhelmed by the time everything is over. I’m not wasting your time by picking a third song from an 10 way tie. Now where have I heard that before? Oasis is famous for their songs sounding fairly similar to existing songs. I’m sure you could pick out a couple listening to it or at least have one déjà vu moment. Follow the bouncing ball. I don’t think I know of an album that I can sing along to as much as I can with this one. It is definitely the album’s greatest quality and makes this one of the best albums to listen to in your car. Champagne Supernova is of course the sing-along high point. Silence. There is a moment in Wonderwall where it’s nearly silent as the guitar fades for a couple beats before the drums start back up. For whatever reason I have always loved that moment. Feuding brothers. Liam and Noel got into all sorts of fights and were a mainstay for British tabloids. It’s worth reading up on their brotherly love throughout the years. Low Points: I usually I struggle with this moment. And you would think with this being one of the greatest if not greatest 90’s BritPop album of all time, I would struggle here as well. I really wish that was the case but I think the original reviews had it right. Even though I am compelled to sing with every chorus on the album, I can barely tell the songs apart minus the two US singles. They’re just so unimaginative and similar sounding. Most of the tracks are just kind of there. Maybe from a historical/cultural perspective they are important but that really doesn’t help me enjoy the songs. Again, not counting the two US singles. I cannot stress that enough.